When people think content, they often think creative. But in reality, great content marketing is a blend of both creativity and data. On the data side of the equation, our industry is still learning. That’s not particularly surprising. After all, the name of the game is, quite literally, content. Many content marketers, some of whom came up in complementary professions like journalism, are so deeply immersed in the content creation process that it can be hard to turn their attention to the data side of things. However, the value of data in the context of content marketing cannot be overstated. So how can marketers best incorporate data into their content strategies? It can help to frame up your thinking on the matter by lumping your data analysis needs into two buckets: post-distribution content effectiveness metrics and data that informs content creation itself. In other words, you must not only consider how data will help you determine whether, and to what degree, your content is connecting with its audience, but also how data can help guide your content creation process up front. Most content marketers, even those who are seemingly laser-focused on the content creation process itself, have some understanding of the need for post-campaign metrics. While creative content executions focus on telling a compelling story, data can inform marketers as to whether the content is actually resonating with people. However, according to the latest data from the Content Marketing Institute (CMI), only 43 percent of B2C content marketers say they have clarity on their content marketing success. Traffic: How large of an audience is your content reaching, and who are those people? Are they truly your target audience? 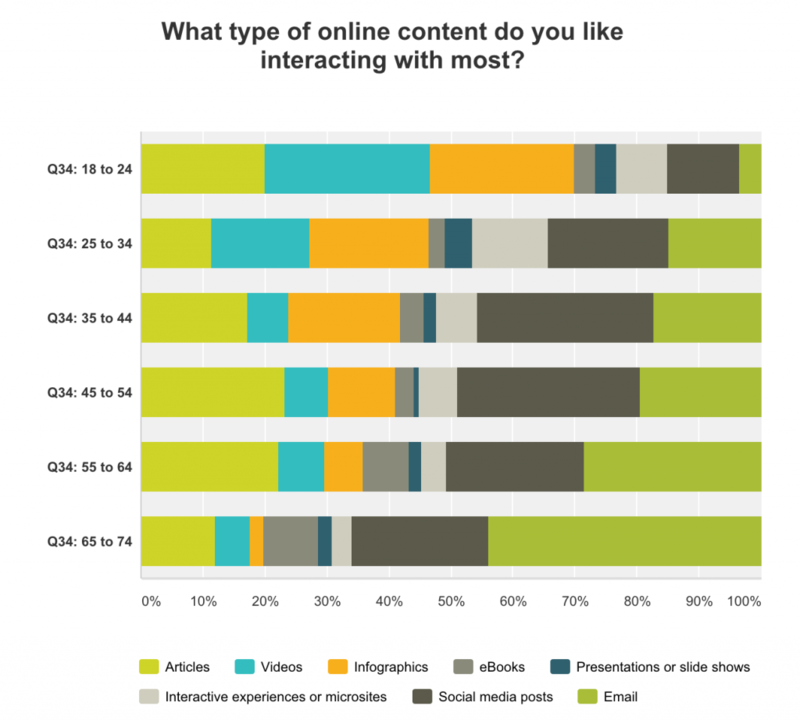 Engagement rates: Are people interacting with your content? If so, how? Conversions: Here’s where the rubber meets the road. What did your audience do after they saw your content? Did they go to your site? Sign up for a newsletter? Download a piece of content? Conversions in content marketing are a cumulative effort. Your content should focus on converting visitors into leads and, ultimately, leads into customers. Beyond tracking the success of content efforts, data can help guide marketers through the creative process itself. B2C marketers have made great strides over the past year in terms of basic documentation around their content marketing strategies. In 2016, 37 percent of content marketers report having a documented content marketing strategy versus 27 percent last year, according to CMI. Yet, this planning and documentation stage is where most marketers fail to leverage valuable analytics. Instead, they “go with their gut” and generate content that they think will resonate. Sometimes they do so with a target audience in mind, but many times, they do so with the intent of reaching the largest audience possible. This approach is folly, and ultimately a waste of resources. A proper data-driven approach to a content strategy can help brands avoid wasting resources by trying to connect with the wrong audiences in the wrong places. Data can help identify target audiences and their trending topics, channel-specific preferences of potential customers, and the influencers most relevant to those groups. Be sure to incorporate data-driven analysis into the following areas of your content strategy. A content strategy is wasted if not developed with the appropriate audience in mind. You need to understand your audience and what type of content and channels are most appropriate for them. Who are you selling to? What topics resonate with them, and how do your competitors communicate with them? It’s important to know what your target audience is talking about, but it’s also important to understand who they’re listening to. To achieve the greatest success with your content marketing, you should seek to partner with other people, and companies in your space, that have a broader reach to produce joint content. Co-producing content and sharing it across each other’s channels will help you leverage new networks, and data will point you to the right partners. Brands that do this right credit their influencer strategies with huge overall gains in social media followers. GNC, for instance, credited more than 380,000 new Facebook fans to its social influencer targeting over the course of just a single year. Companies need to be using real data around the above three points to guide their content creation efforts. Too often, the cart goes before the horse, with marketers focusing their discussions around the hottest topics, channels, and celebrities. For example, a blue-skies content discussion today might naturally lead marketers to consider how Pokemon Go, SnapChat and the latest YouTube star can be leveraged in their creation efforts. Why? Because the audience around that topic, on that channel, and following that person right now is massive and engaged—and frankly, it’s fun to think about being a part of that. But pump the brakes for a second, and think about your brand. If you’re McDonald’s or Coca-Cola, focusing your efforts on “hottest” might make sense. But for most brands, your content efforts need to be guided much more by “relevant,” not hottest. For example, maybe you represent an insurance brand looking to make in-roads with mid-sized business owners. You could create the most hilariously compelling series of Pokemon Go Snaps ever, promoted by Smosh itself, and receive views and social shares unlike anything you’ve ever seen—and be absolutely no closer to your achieving your KPIs than when you started out. Ultimately, having fewer of the right people viewing content is much more effective than thousands of the wrong people. A data-driven approach would more than likely point your content efforts down a much more practical path. When you discover that your target audience of mid-sized business owners are far more engaged on desktop than mobile, via email and whitepaper content from other successful entrepreneurs, and around topics like the most-coveted employee perks, you’re working with content insights that can actually help you deliver on-brand value to your desired audience. I know what you’re thinking: This is all well and good, but how can marketing organizations structure their teams for the optimal blend of content and data expertise? Here, too, you must strive for a blend of art and science. When it comes to tracking the success of content marketing, those teams tasked with content creation should also bear the brunt of the responsibility as it relates to understanding its effectiveness. Content teams must have direct access to basic metrics related to traffic, engagement, and conversions. However, when it comes to leveraging data for content strategy development, you might find a need for some deeper analytical expertise. Your team must be equipped with either content marketing tools or data scientists—or both—in order to uncover the audience, topic, and influencer insights that will ultimately inform a successful content strategy. Ural Cebeci is the VP of Marketing at ScribbleLive, the leading content marketing platform. Ural brings a wealth of marketing and strategy experience with more than 15 years of experience. Prior to ScribbleLive, Ural was the VP of Marketing at Visually where he built the marketing team from ground up until its acquisition by ScribbleLive. He also worked as the Director of Marketing at Optimizely during the company's early growth stage and headed up teams at Skype and Microsoft.